Yesterday, something totally horrific happened at the Knitting in Pink household, a hand knit sock went AWOL. In the morning, I placed my Simply Cables socks on the chair in our bedroom, thinking they were safe there and would not go anywhere. Later that day, after DH came back from work and changed into more comfortable clothes, I went back to the bedroom and discovered that something terrible had just happened. I saw that one sock was crumpled on the floor and the other one simply had vanished. After a heated discussion with the hubby I started tearing apart his drawers and his closet. You see, when he changed that evening, he had put away all his clothes that were also being stored on the chair and that’s when the sock went missing. I looked everywhere, inside drawers, unfolding and refolding his pants, doing the same with sweaters and even digging through the dirty laundry. Sadly, the sock stayed un-found. 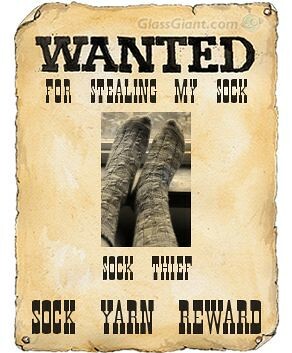 This morning I created a Wanted poster hoping that someone would come forward assuming the theft of the sock. It was either DH or me and if we’d had a cat, I could have blamed the cat too! After coming home from work tonight, DH decided that he would start looking for the sock again, him accusing me (jokingly) that I had lost it, and me, accusing him of stealing it! A few minutes later, DH comes out of the bedroom with a pair of socks in his hands! The sock had been found! Hurrah! He wouldn’t admit it, but I found out that he indeed had bundled the sock up by accident in one of his shirts the evening before. Phew, crisis averted. Happiness is restored in the KIP household. PS 2: if you want to make your own Wanted poster, go here! PS 3: DH is not claiming the sock yarn reward, I guess he doesn’t like yarn as much as I do! His loss! They turned out great! I’d watch out. It may just be his way of making sure you have to do all the “clothes putting away” all the time now!! phew! 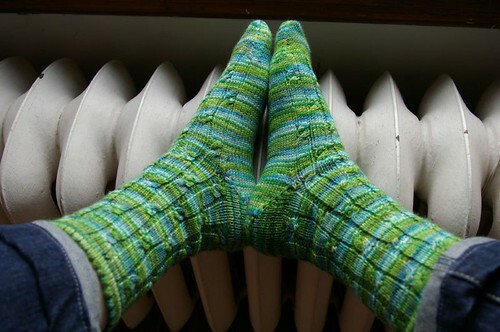 So glad that you found it, those are some beautiful socks! When my kids forget to put their handknit socks in the handknit bag (I like to wash them separately) I dig and dig though the laundry to find them. I am assuming his sentence was commuted to time served? Glad you found it, they’re gorgeous! What a relief you found your sock again. Great poster.